Today's ImPokédex entry is of Cresselia, aka Princess Porygon. Update: Upon further consideration, I decided to add Darkrai (aka The Grim Underbite) to today's entry, since it's the nightmare giver to Cresselia's nightmare taker-awayer. Fair enough - consider the two paired. 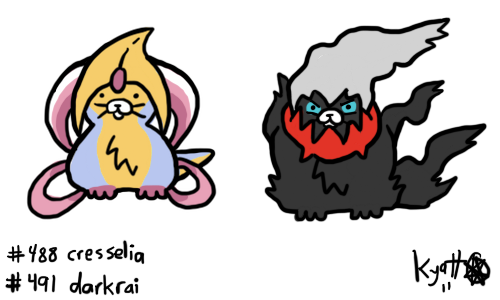 Also ImPoke!Darkrai has the most "I'm a cat, what do you want" eyes ever.